Business accounting software is a type of either online or offline application software which is used to keep tracks of accounting transactions or to manage money flowing in and out of a business. Business accounting software is a better solution for managing account of a business and it can easily manage accounts payables, account receivables, general ledger, business’s payroll and other business modules. Business accounting software has a number of advantages such as it ensures accurate financials of the business, time-saver, convincing, cheaper operation and higher overall productivity. Such benefits of business accounting software make this software more acceptable in small businesses. Some popular business accounting software includes zoho books, quick books, ava tax and dynamics are available in market. Global business accounting software market is envisioned to flourish at a compound annual growth rate (CAGR) of 6.3% over the forecast period i.e.2017-2024. 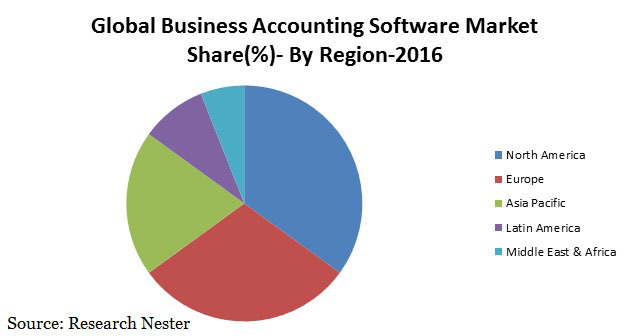 The global market for business accounting software was valued at revenue of USD 3.2 Billion in 2016 and is projected to reach at valuation of USD 4.4 Billion by the end of forecast period. Rapid emergence of business accounting mobile application and growing demand for effective way to manage accounts of small businesses are expected to be the dynamic factors behind the growth of global business accounting software market. Moreover, Asia Pacific region is anticipated to be fastest growing market for business accounting software during the forecast period. Asia Pacific region is also expected to grow at a robust pace owing to the factors such as emergence of small businesses and growing investment in business sector are likely to bolster the growth of global business accounting software market in Asia Pacific region. Global business accounting software market is primarily driven by growing demand for better account managing solution in business & enterprises coupled with increasing penetration of business accounting mobile application to manage functional modules of business. Further, increasing adoption of cloud accounting software to manage finances is also a major factor which is driving the growth of global market of business accounting software. Moreover, business accounting software has ability to manage business modules such as account receivable, billing & invoicing, sales & purchase, account payables, business payrolls and reporting. These abilities of business accounting software making this software more acceptable in business sector, especially in small businesses. Considering all these factors, global business accounting software market is expected to be growing at a satisfactory pace in near future. Furthermore, introduction of optical character recognition technology (a technology that can convert printed material into digital data) in the business accounting software is a major factor which is expected to fuel the demand for business accounting software in business sector. In addition to this, rising inclination of business sector towards green IT technology is also a major factor which is likely to drive the growth of global business accounting software market in near future. However, compatibility of business accounting software with change in technology is a major challenge to the market of business accounting software. Additionally, increasing commoditization of business accounting software is major factor which is envisioned to dampen the growth of global business accounting software market in near future.